Mint Hot Chocolate for Two! The best thing about the holidays is the act of giving. I think the best kind of gifts are the ones that are made with love and homemade. I love making small tokens for neighbours, secretaries, tellers–basically anyone who makes a difference in my daily life something small but, special. I thought I’d share one of my favorite gifts to give that not only provides a warm and delicious treat but, the invitation to share it with someone else. 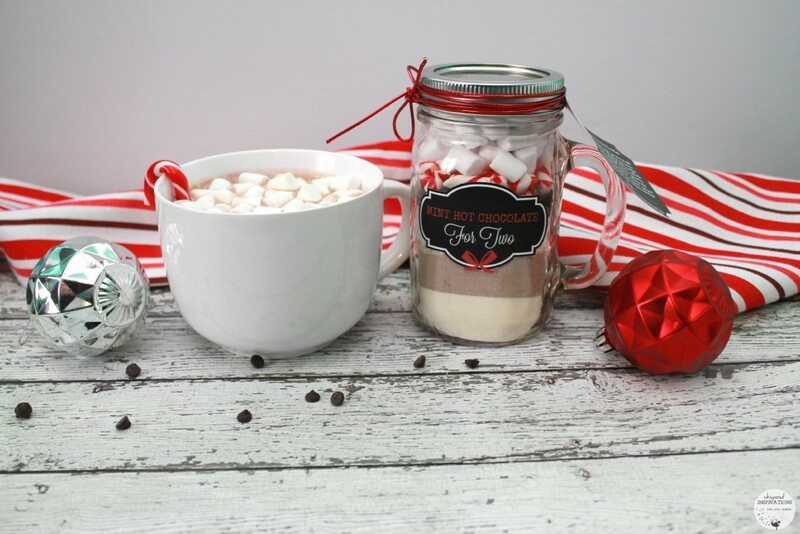 My Mint Hot Chocolate in a jar is always a hit and I don’t mean to toot my own horn but, it’s extra creamy and perfectly sweet. One of the best parts is that you can make it all at home. All you need is ingredients you may already have in your pantry, paper, and an HP printer. 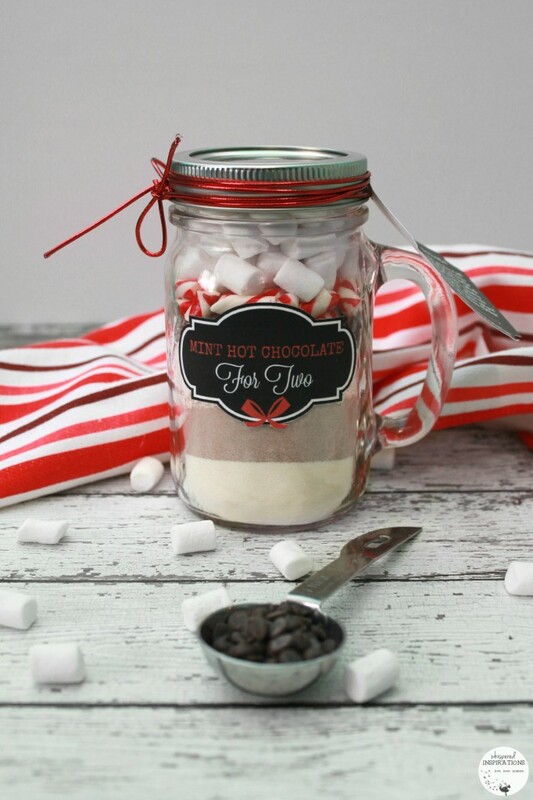 This Mint Hot Chocolate recipe for two is an invitation for the receiver to enjoy a warm cup of chocolate goodness on a cold winter’s day with someone special. To me, I think that connecting with someone one on one is super important in this world’s digital-age. So, drop the smartphone and invite a friend over or share it with your significant other or take some time to sit down with your child and really have a great conversation. You’ll be glad you did! 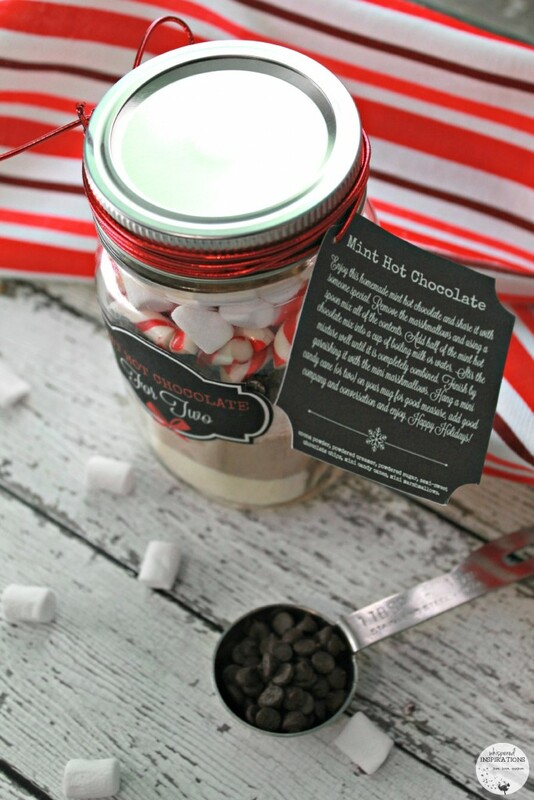 To make this gift, you will need to print out my Mint Hot Chocolate label printable and the Ingredient and Instructions label printable. That means you will need to make sure you have enough ink for your printer. What is more frustrating than running out of ink when you need it the most? Especially when you want to make a quick gift for someone and want to print off a cool printable and it’s too late to get more ink. We’ve all been there, trust me. So, the only solution is to NEVER run out! Yes, that’s totally a thing! With an HP Instant Ink subscription, you’ll never have the issue of running out of ink while you are tacking a project or the inconvenience of having to run out to the store to get more. Your printer will let HP know when you’re running out of ink and then HP will send ink cartridges right to your door. So forget running out to get more, it’ll be there when you need it. Plus, you can save up to 50% off in comparison to HP Original Ink. The HP plans start at $3.99/month for occasional printing (50 pages per month) and go up to $10.99/month for frequent printing which is about 300 pages per month. It’s simple! Try this super creamy mint hot chocolate and share a cup! You'll love the subtle sweetness and the hint of mint. Carefully spoon 7 teaspoons of creamer. Gently push down to compact. Add 7 teaspoons of cocoa powder and carefully push down. Scoop in Mini Chocolate Chips and push down to compact. Fill the rest of the mason jar with Mini Marshmallows and add the lid, screw on until tight. Download and print off the labels, cut out the label and peel and place.If you choose not to use labels, use regular paper, cut out and attach to mason jar with glue gun. Use card stock paper for instructions and ingredients, poke a small hole and add to ribbon. Place ribbon on lid and tie a bow. 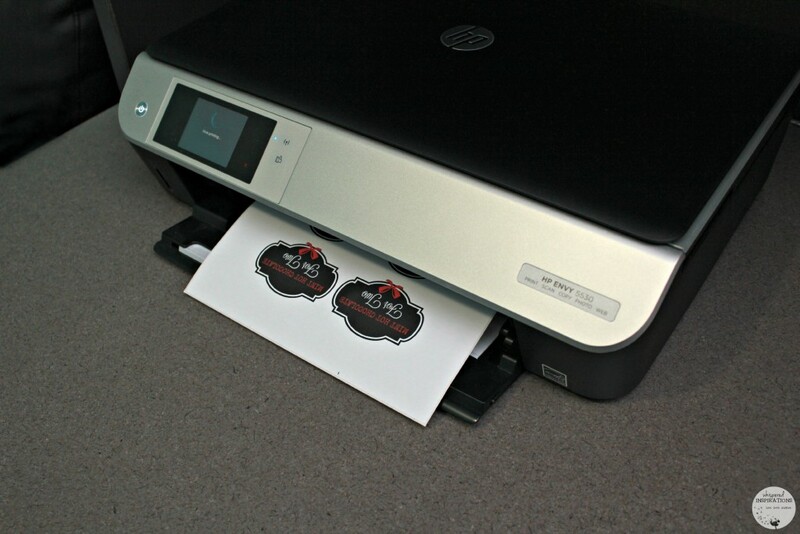 Now that you know all about HP Instant Ink subscriptions, you’ll never run out. You will always have ink to work on your projects, get those last-minute homework assignments printed or make heartfelt gifts like the hot chocolate for two! If you like DIY projects, check out check out HP Printables and MyPrintly. You will love all the awesome ideas! Make sure you head over to HP Instant Ink to get more information or to sign up for a subscription, that way you will never run out of ink and have it when you need it! What would you make with your printer? Previous Post: « Frozen Fever Deluxe Doll Gift Set: Make Any Frozen Fan Happy This Year with This HOT Toy! There are so many great things I would print. Disney printables for my son and I to colour, :-). labels for homemade gifts and tags for storage around the house. I would be printing some puzzles. Crossword, Find a word, Suduko. I would love to make cards with my new printer. I would make all kinds of cards. I would make a few sheets of the Olaf coloring page and let the kids have fun coloring! Me too, that way you will never run out of ink. I would definitely get some colouring pages. i would make a menu planner! The Disney printables would be a huge hit in our house! The DIY Glitter Star Wars Symbol Ornaments would be a really fun project and something special and unique to hang on the tree. I would make a crossword puzzle. My hubby would love the Universal Crossword printable that you can get. I love that HP offers crosswords on their Printables site! We used to fight over the ones in the newspaper at work. This would solve that problem- everyone could have their own. I would use it to print a big stack for everyone to share. I would print Christmas cards. The Leaf Napkins are lovely. I'd like to try making these. My grandson would absolutely LOVE the R2D2 Interactive Robotic Droid in your Holiday Gift Guide. I would print the Disney sheets for Sophie and the universal crossword for me. I would make my own Christmas cards. The Disney Colouring pages look like they would be great to get and have on hand for little visitors! I really like the jar labels for gifts or pickling! I would use it to print out forms and invoices. I would print the Universal crossword puzzles. We are crossword fanatics here so I would love to print out their Universal Crosswords. I would make some Christmas tags. I would print some Disney colouring pages. I would also like to print the 7 days menu planner. I'd love to get the Inside Out movie for the family. It was our favourite movie of the year! I'd like to make the Thankful Place Cards, they are such a nice and thoughtful addition to a dinner table setting. Love the crossword printable because my hubby loves doing them, so it would be perfect for him. I'd print a lot of the crosswords – they would be great for travel as well as just quiet moments at home (with coffee!). I'll be printing myself a daily crossword! I like the Thankful Place Cards but would change them a bit to make them for Christmas. I'd make some cool cards for my friends! I'd make the Candle Wraps – great idea! My kids would love to make the DIY Glitter Star Wars Symbol Ornaments. I'm starting a new eating regimen, so I'd print a 7 day meal planner. I would get the crossword printable, my hubby loves to do them and it would be great to print off and put in his lunchbox. Christmas cards would be first on my list and then labels for my boxes and storage boxes. I visited HP Printables. I would print coloring pages, coupons, recipes and cards! On my Wish List is a deep freeze and a food dehydrator. I would do a lot of colouring pages for my kids. The Burlap Wine Bottle Bags are a fabulous idea and would make a great gift as well. Would love to make these. Menu Planner would be handy. The colouring sheet printables are great, love having them on hand for my nieces/nephews. The Brownies in a Jar Tag for Hostess Gift would be nice to make. Christmas cards would be first on my list – I still have some to send. I would print off some labels to put on the tins of cookies and nuts that I am giving to people. I'd like to make the Snowman Kit Treats. These are such a fun idea! The crossword printables would be a hit in our house. The Holiday Happy Notes for Kids & Family would be nice to make. They look pretty easy to create and are a sweet idea to use throughout the year – not just for the holidays. I need to make some labels for my spices so that is one thing I would do. I would print some recipe cards. I would make Christmas cards! I choose to make the Holiday Happy Notes or Random Act of Kindness Notes as I would call it. I would make cards for all occasions. The Photo Memory Tins would be a lovely project. My kids would love if I printed Disney colouring pages and activities! The printable for the menu plan would be something I would look at doing. Well it was to be Christmas cards but it's really too late now, so perhaps address labels. I'd definitely print some coloring pages! love to make and print out the snowman kit craft. Making some Christmas Tags for gifts would be a nice thing to do. I love the Disney printables & the Star Wars ornaments! The Crossword Printable would be great, would be fun to put together a binder of them for my hubby. I would make thank you cards for the kids to send to family after xmas! I would print some colouring pages. The 7-Day Menu Planner is a great idea for families! I would print that on my HP. I would print Christmas cards for family and friends!! Would try using the Meal planner to see if it can get me into the habit of planning in advance. Labels for all the homemade goodies we do up at Christmas would be nice to do. One always needs birthday cards too right? So I'd print some of them too. I would print labels for the kitchen. Birthday cards, they always come in handy don't they? Some colouring pages to have on hand for when we have little ones visit. I would make greeting cards. I would print some brithday cards.. I Would definitely print off some of the Crossword printables for my hubby. The Paper Snowman is super cute! 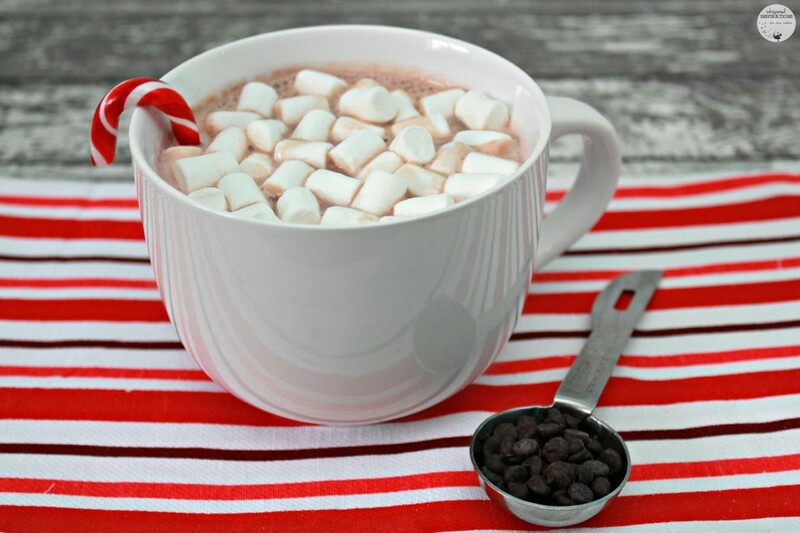 Now that the cool winter is coming in I can’t wait to have some mint hot chocolate!